We believe every BIG BROTHER is a superhero! Let Superkid Capes help your big-brother-to-be feel extra special about his new role. 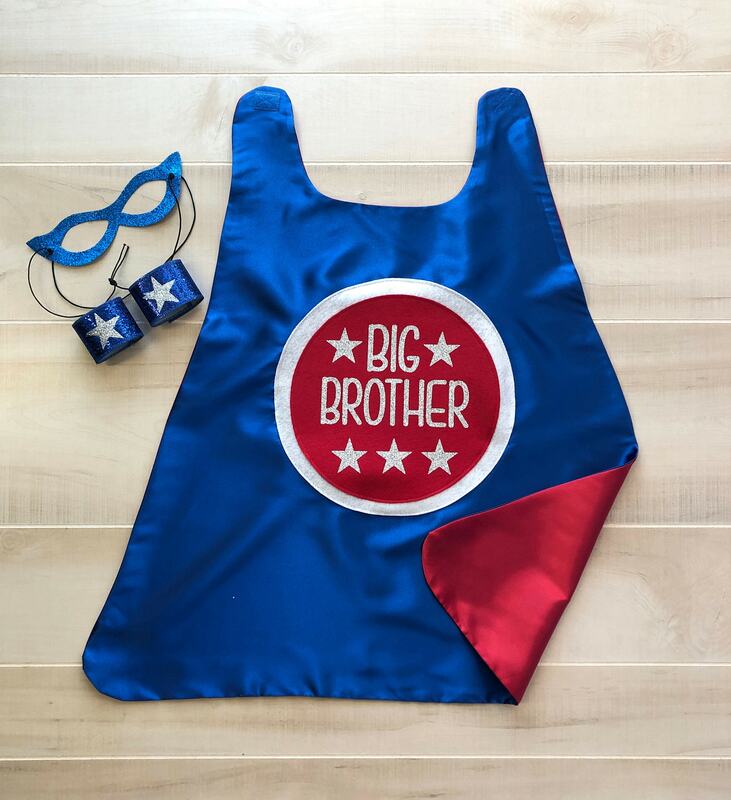 1 Super big brother cape or big sister cape with optional accessory wrist bands and superhero mask! Color examples are shown in the pictures. Choose from a blue/red cape, a purple/pink cape, or turquoise/red cape! This awesome big brother cape is double sided, with the design on the outside and a separate lining color. All our capes are hand sewn in our workshop by our awesome team of moms to ensure the highest quality! Our superhero wrist bands and masks are made of a durable sparkle material, and the sparkle does not rub off! This is the cutest! Came fast, made well, i am VERY happy with my purchase. Very nice quality, and very cute. It took much longer to receive item than expected as it was listed as 1 available and ships quickly and I paid for expedited shipping but item took two weeks to arrive. Thanks for the fast shipping. Great cape. My nephew loves it.